What Does Our Hardwood Floor Sanding Include? Before any sanding can commence, we need to know exactly what we have on our hands. Floors vary in how they age and factors like the overall traffic, flaws created during installation, and individual accidents all play a role. You’ll receive an on-site inspection with a no-obligation quote afterward that determines the amount of work and the estimated time. We understand that hardwood floor sanding can be a time-consuming and disruptive process, which is why we take the commitment to offering you the greatest comfort so seriously. The actual sanding itself is handled with absolute precision, and to help with this the experts are armed with equipment provided by BONA. We use the latest in sanding technology, tools which will give any floor a smooth and even finish without coating the whole room in sawdust! But We Don’t Only Sand Hardwood Floors! Restoration and repair: If your floors have sustained damage in any significant way that makes sanding ineffective, we search high and low to find the exact same wood material with patterns and color closest to the original. Gap filling: Gaps can cause further deterioration of any hardwood floor and we can’t have that. We work with sawdust and raisin to fill gaps or use a wood inlay for bigger ones. Staining: It’s not just the feel of the wood that matters, but the look as well. Choose from the rich collection of staining options to enhance your floors’ aesthetic properties. Sealing: The varnish determines how your floor surface will look without the need for a second sanding, and you’ll be happy to learn we work with high-grade natural materials that allow the wood to breathe. 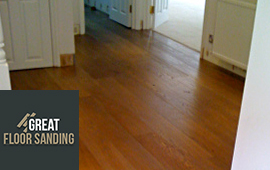 Ordering a service from Great Floor Sanding is a straight forward process. Make sure you give us a call at 020 3404 9697 and ask for your no-obligation on-site inspection! It can be on any day of the week without exceptions. We’re here to help you with organizing your service from morning to evening, answering questions and providing updates. You can also alter the arrival time and date of your team as many times as you need as long as you provide us with 48 hours’ notice.